Summer is fast approaching and I can't think of a better way to beat the heat than kicking back with a delicious, refreshing cocktail in hand. And what better way to enjoy a delicious, refreshing cocktail than from the comfort of your own backyard? 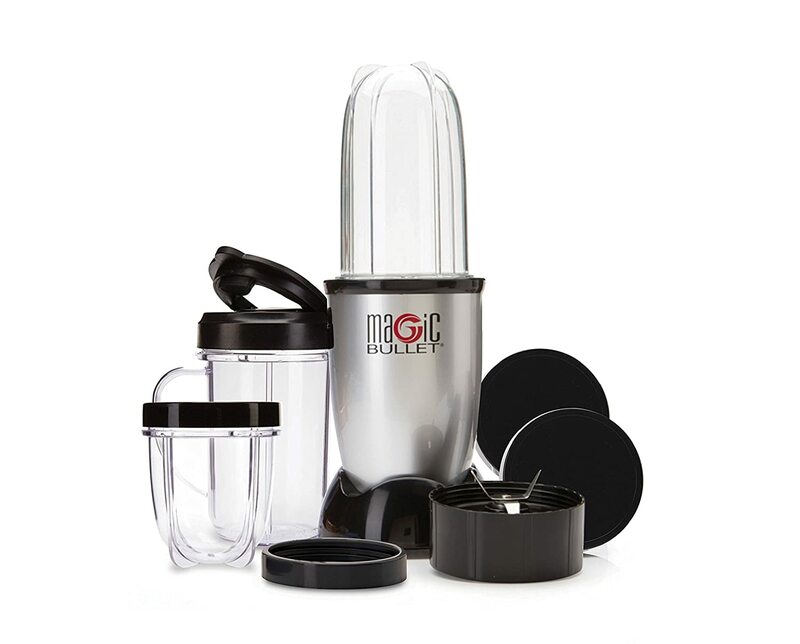 And the easy key to making that a delicious reality is with The Magic Bullet! We here at Oola have compiled a list of our favorite summer cocktail recipes, all of which can be whipped up in a jiff through the wonders of the Magic Bullet. As a side note, every recipe listed can certainly be made in a traditional blender, but definitely keep in mind portion sizes as these recipes were designed for the Magic Bullet! Do you want a tasty cocktail, but don't feel like going to all that trouble of buying a lot of ingredients? Well, this recipe is for you. Thanks to user Tinkerbell, All you need is daiquiri mix and some of your favorite light rum. Easy enough, right? Trust us, you won't want to put it down! Erin Allmann's alternative take on the classic Mojito will sure to be the talk of any summer party you happen to find yourself - and your Mojito-rito - at. Who doesn't love a good marg? With summer fast approaching, Magic Bullet HQ created a cocktail that's perfect for a relaxing day in the sun. Feel free to replace the ice with your favorite frozen fruit for a flavored marg! Erin Allmann is back with a super sweet and refreshing drink that totally makes up for the dryness of gin. Plus, the ingredients are very common so you won't have to buy an obscure bottle of liqueur you can't pronounce to complete the drink! Clearly, Erin Allman has quite the knack for alcoholic Magic Bullet recipes. If you're a fan of rum, you're gonna love every last drop of this fantastic cocktail. Incorporating orange juice and grenadine, this cocktail will prove to be as pretty as it is tasty. Who doesn't like adult milkshakes? Especially one as divine as the Bushmills Honey Milkshake. Featuring the likes of graham crackers, ice cream, and cinnamon, you would be hard pressed to find a more tasty adult beverage this summer. Kyle over at the Magic Bullet Blog is an evil genius for combining so many delicious desserts with booze. Vodka, cranberry juice, lime, ice. Blend them all together and voila! You have KitchenMagician's delicious (and oh so not literal) frog in a blender. There's a whole lot of variations of the DIY pina colada, but thanks to Kristianne from the Magic Bullet Blog, this one's probably the simplest of them all! Perfect for any occasion, this tasty treat will have you singing like Rupert Holmes all night long. Thanks to blogger HezziD, we can now drink pineapple upside down cake - and get drunk while doing it! This super simple cocktail is normally made with a shaker, but who says a magic bullet won't work just fine? Danae at Recipe Runner has crafted a bonafide masterpiece with the bourbon peach slush. All you need is a little ginger ale, juice of lime, sugar, and voila! Who knew peaches and bourbon meshed so well? Compliments of Magic Bullet HQ, this cocktail is so fancy you'll swear you're sipping it by the New York skyline. You'll most likely need to take a trip to your local liquor store for this one, but trust us: it's worth it! What do you get when you combine sherbet, limeade, and rum? Thanks to Lori Ann at Lori Ann's Food and Fam, we have the answer: A very simple and delicious cocktail, of course! Thanks to Kate at the And They Cooked Happily Ever After blog, you would be hard-pressed to find a more delicious (and patriotic) drink this summer. Featuring the likes of cranberry juice, blue curacao, lemonade, and vodka, this cocktail will sure to be the talk of any summer party. Note: This drink is better suited for a traditional blender. You know you have a good cocktail on your hands when there's jalapeño infused tequila involved. This one is a little bit of a project, but oh-so worth it for the final product. Big shout out to the folks over at Everyday Epicurist for this one! Got 5 minutes to spare? Good, that's all you need to make this delicious cocktail from Sara at Budget Savy Diva. Seriously, it's so easy. Go make it! And there you have it, folks! Whether you're feeling fancy with the Sky High Manhattan, kickin' back with the Mojito-Rito or enjoying a day by the pool with the Super Simple Pina Colada, there's a drink for every occasion. Whatever your preference, we're confident you'll love at least one of these awesome cocktails in your hand this summer. Enjoy!